Contains 4 - 4.2oz tubes of fluoride toothpaste for children. Say hello to naturally friendly bubble gum fluoride toothpaste. Prevents cavities, strengthens enamel, polishes and brightens. Tastes awesome. No dyes or artificial sweeteners, no preservatives. No brainer! 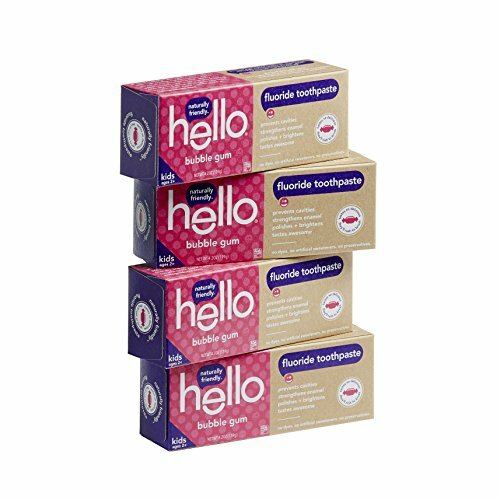 Hello is thoughtfully formulated with high quality ingredients like xylitol, stevia and a silica blend that gently polishes teeth. We're serious about being friendly, and about what goes into little mouths. ADA Approved. Free from dyes, artificial sweeteners/flavors, preservatives, microbeads, triclosan and gluten. If you have any questions about this product by Hello Oral Care, contact us by completing and submitting the form below. If you are looking for a specif part number, please include it with your message.